Please welcome our newest fly boy CP-5092 Glitch fresh from pilot training. Another redback first and Aussie first and one of only 11 AOTC pilots in the Legion....Well done Sean. Wow! You're must have a production line going. Any chance I can throw my armour on the conveyor belt with your other builds? Congratulations Glitch sure looks like you are cloning yourself. Look out Meanie and Buppet! G-glitch is on your tail! Well done, G-glitch, you are powering on ahead with cloning yourself! oh wow i'm already approved hahaha! this makes 5 costumes for me! funny enough, another guy was approved at the same time! so i'm either the 14th pilot and first outside the USA, or i'm the 15th pilot and first in Aus! 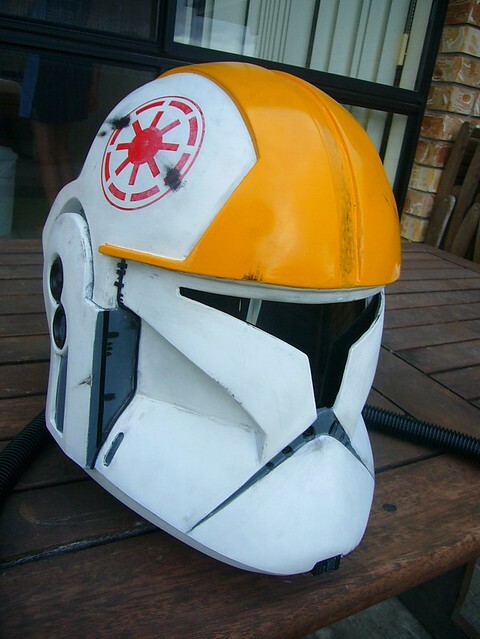 i kinda wanted to be 15 anyway, the other guy was from the chinese outpost and i don't mind being 14 or 15.
and i really like the way this helmet turned out, it looks amazing! Congrats mate, another clone on the ready line.